Handibot® Smart Power Tool Adventure Edition is the innovative power tool you can take anywhere and run from any WiFi-enabled device. Use it to perform precise and easily repeatable cutting, carving, machining, and milling operations. Work with wood, MDF, plastics, foams, and aluminum. All at the press of a button. This is CNC, totally reimagined: less hassling, more making. 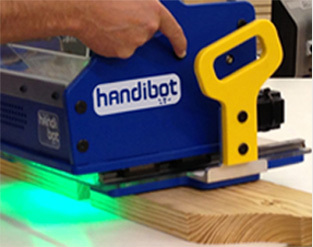 Unlike other CNC tools, the Handibot tool is pick-up-and-carry-portable! Simply place it directly on your material, whether it’s on a table, the floor, the wall, or even the ceiling. The tool cuts through its base into whatever you’re working on. You've got freedom to work wherever the work takes you. You don't need to know how to use CAD and CAM software, you can simply use apps to make projects and run the tool to do simple jobs. If you want to work with the traditional CAD to CAM workflow, we provide access to two powerful software programs for creating CNC projects: VCarvePro ShopBot Edition and Autodesk Fusion360. FabMo also lets you create anywhere you want. 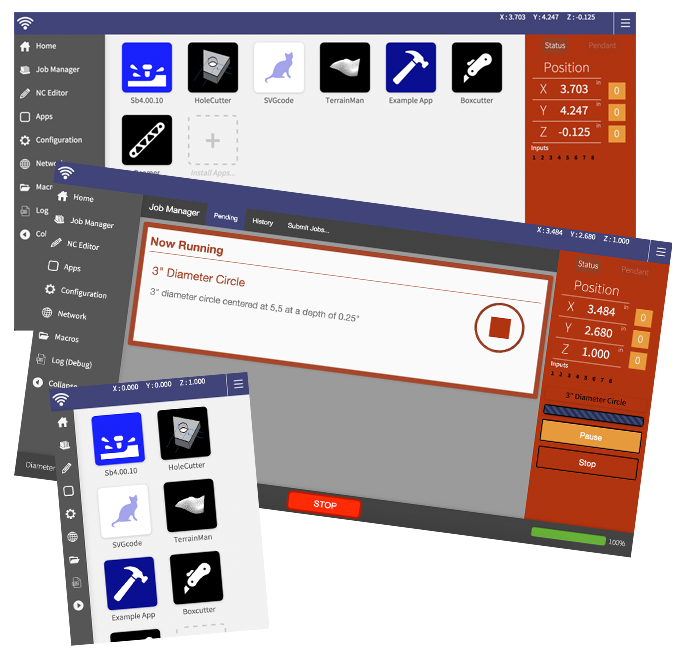 Control and monitor the Handibot tool from any WiFi-enabled device: a Mac or PC computer, an Android or iOS phone, or any tablet. This is wireless CNC! Learn more below in Software Developments. 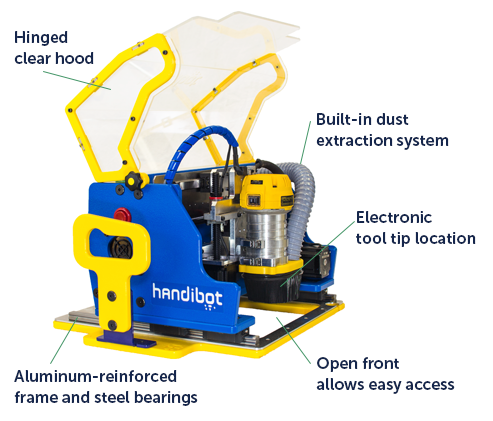 Grab your Handibot Smart Power Tool and your smartphone and go your own route: get to work at remote jobsites, manufacturing facilities, schools, makerspaces, Fab Labs, and home DIY workshops! 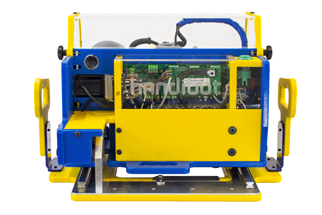 Handibot’s rigid, aluminum-reinforced frame and steel bearings ensure clean, precise cuts. Electronic tool tip location makes changing tools during a job quick and reliable. Optional accessories free you to carve your own unique path. Do 3D carving with the Handibot Rotary Axis. Use the Laser Sight to align your tool for quick hole cutting. Get the Large Material Indexing Jig and cut on larger materials, up to a 4’ x 8’ sheet. Cut paper and vinyl using a Drag Knife bit. On the software side, huge news! The Handibot Smart Power Tool Adventure Edition is the first digital tool to run on the new software platform, FabMo — short for digital fabrication and motion. FabMo is an open-source, digital fabrication and motion platform of software and hardware. Originated by the Handibot team at ShopBot Tools, FabMo has a powerful core motion system, G2, created by Synthetos. FabMo is available to be used and adapted by anyone, to run every digital smart tool imaginable, today and tomorrow. Use any WiFi-enabled device to run or monitor the tool's activity. Mac or PC computer, Android or iOS phone, any tablet. You don't even need to have Internet access; use Access Point Mode (AP Mode) and you'll be connected — you can be working with your Handibot tool in your cabin in the middle of nowhere. 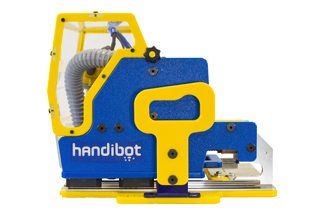 As a network capable device, the Handibot tool does not depend on physical connectivity (e.g. via USB) with a computer or smart device to run a file. Once you hit "start," the file is on the Handibot tool's small onboard computer. No more connection failure issues to worry about when running a cut file. If you'd like to use a CAD to CAM workflow such as with VCarve Pro or Fusion 360, feel free to do so. Now you can easily control the Handibot from the FabMo Dashboard via any web browser. But you can use the Apps approach instead, eliminating some potentially cumbersome steps. The Handibot ships with a number of ready-to-go Apps for doing various tasks (and more are being developed — want to get involved?). The Apps model makes it easier to work anywhere you want to be. SINGLE-TASK APPS - Coming Soon! The Handibot Smart Power Tool Adventure Edition can pull software updates automatically via the Internet. The future of smart tools starts here: Handibot is an open source development project that invites your participation. We encourage the community of developers to work on hardware and software development, and even the manufacturing of the tool — we view this as the responsible and most efficient way for Handibot to evolve and meet its potential to serve the larger community's needs. 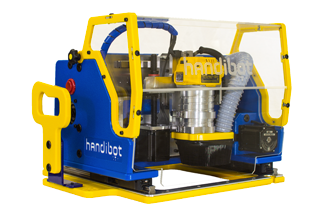 Handibot® is a trademark of ShopBot Tools, Inc.
By signing up (free) you'll be able to post projects, share your ideas, vote, comment and so much more. First Name: * Last Name: * Email: * Password: * Display Name: * I acknowledge that I am at least 18 years old. Enter the verification code you see above in the following field. Enter your email address and we'll email you your password. This Handibot website is provided by ShopBot Tools, Inc. (hereinafter “ShopBot”) subject to the following Terms of Service (hereinafter “TOS”). The TOS constitute a binding agreement that conditions your use of this website and may be updated by us from time to time. You are granted a non-exclusive license to use the material on this website (hereafter “Content”) while connected to this website for your personal use. We will not collect information from you other than personal information you supply us voluntarily. “Cookies” may be saved on your computer for the purpose of improving your experience on the site. With respect to transactions in the Handibot Store, we will use personal identification information that you supply us (such as name, billing address, shipping address, e-mail address, telephone number, credit card number, expiration date and PIN number) to provide the products and services that you have ordered or requested, to process and ship orders, to send order and shipping confirmations, and to provide customer service and technical support. This information may also be used to contact you about sales and special offers from us. You may opt out of continuing to receive such communications simply by clicking on an “unsubscribe” hyperlink contained in e-mail communications we send you. We may also use your personal identification information for internal or marketing purposes. We will not provide your personal information to other companies. We or our service providers may release personal identification information if we believe in good faith that the law or legal process requires it, we have received a valid administrative request from a law enforcement agency, or such release is necessary to protect anyone’s rights, property or safety. All Content included on this site, such as text, graphics, logos, icons, images, and audio clips is the property of ShopBot or its content suppliers and protected by United States and international copyright laws. Open-source and public domain materials or property part of the Handibot Open Innovation Project will be clearly marked as such. The compilation of all other content on this site is the exclusive property of ShopBot and protected by U.S. and international copyright laws. All trademarks used or referred to in this website are the property of their respective owners. All rights not expressly granted are herein reserved. While it may be possible to link or otherwise connect from this website to other websites, such connection is done at your own risk. By providing a link from this website to other websites, ShopBot does not endorse or in any way take responsibility for content that may be posted or events that may transpire at those other websites. You expressly understand and agree that ShopBot shall not be liable for any direct, indirect, incidental, special, consequential, exemplary or punitive losses or damages, including but not limited to losses or damages for any lost revenues or profits, based upon or related to use of any content on or accessed through this website or any website linked to, or any copying, displaying, or use thereof, even if ShopBot has been advised or made aware of the possibility of any such losses or damages. You expressly agree that use of this website is at your sole risk. All materials and services on this website are provided “as is” without warranties of any kind. ShopBot makes no representations and disclaims all warranties, express or implied, including, but not limited to, warranties of merchantability and fitness for a particular purpose. Some jurisdictions do not allow the exclusion of certain warranties or the limitation or exclusion of liability for incidental or consequential damages. Accordingly, some of the limitations CONTAINED IN THE PRECEDING PARAGRAPHs may not apply to you. Through your use of this website, to the maximum extent allowed by law, you agree to indemnify and hold harmless ShopBot and its affiliates, officers, agents, and employees from and against any and all liabilities, expenses (including attorneys’ fees) and damages arising out of claims resulting from your use or misuse of this website, including, without limitation, any claims alleging facts that if true would constitute a breach by you of the TOS. The laws of the State of North Carolina will govern the TOS and your use of this website. By using this website, you agree that the exclusive jurisdictions for litigating disputes arising out of or relating to your use of this website or the TOS shall be in the state or federal courts in Durham, North Carolina, and you agree to waive any objection based on forum non conveniens or any objection to venue of any such action. The TOS represents the complete agreement between you and ShopBot with respect to this website and supersedes all prior or contemporaneous communications or agreements between you and ShopBot with respect to this website. The failure of ShopBot to act with respect to a breach of the TOS by you or others does not constitute a waiver and shall not limit ShopBot’s rights with respect to such breach or any subsequent breaches. In the event that any provision in the TOS is held to be invalid or unenforceable, that portion shall be construed in a manner consistent with applicable law to reflect, as nearly as possible, the original intentions of the parties, and the remaining portions of the TOS will continue in full force and effect. Copyright © 2014 ShopBot Tools, Inc. All rights reserved.